At 3:30 a.m. Wednesday morning, I left my house in Wheaton. At 6 a.m., I flew from Chicago O’Hare to New England for a surprise trip home. Besides my parents, my cousin Jonathan was the only one outside of Wheaton who knew I had no way home. I’d tried all semester to find a ride to CT for Thanksgiving, but everyone from CT was either flying back or staying around campus. A week before break, I still had no way home. Because I couldn’t afford a plane ticket, Jonathan let many of my other cousins, aunts and uncles know so they could chip in to buy me one. “It wouldn’t be Thanksgiving without you,” he told me when I thanked him. I told my dad about God’s provision before another cousin asked me to keep it a surprise, but my mom and sister had no idea I was going to Thanksgiving with them. My Aunt Carol and cousin Becky picked me up from the Providence airport, and we visited a park in Rhode Island that Wednesday. Here I pretended to be queen of the castle. Rhode Island has a unique beauty, though. It’s quaint, with lots of little streets. We had fun adventuring around the city (a.k.a. being lost on the way to the park). Then I visited a tropical island for a minute…I mean, we stopped at a smoothie place in Massachusetts since I hadn’t eaten. Next we continued on to my aunt’s house in New Bedford, MA, where I played with a three year old the family nannies, ate lunch, and napped for eight straight hours. (Oops. I had meant to play family games, but apparently two hours of sleep before a red eye flight exhausts a girl.) I woke up for a couple hours to eat dinner at 10:30 p.m. and wrap presents, and then I slept for another six or seven hours until the morning! We proceeded on to Connecticut, my beautiful old home, for the family picnic in Cochester. But mom was happy I was there! My sister Hannah was excited, too. She exclaimed, “WHAT? !” and then did a jig. While my dad made mashed potatoes for most of the 52 people in attendance, I mashed a small bowl for the dairy free among us. After eating, we played football. I made a touchdown at the start of the first game! We ended up losing that game, but my team was 2-1 in the end. Typically those who play football shovel coal afterwards since that’s how Aunt Penni and Uncle Rick heat their house for the winter, but they had already done that, so we went straight to the pie eating, conversing and hymn singing. I spent 10 hours total at their house this Thanksgiving Day! On the way to the house in which I was staying overnight, my subconscious dream came true: we went through Hubbard Park and saw the lights!! I hadn’t seen them for two or three years! The lit globe has always been my favorite. On Friday morning I went to Cheshire Coffee with my friend Jared. It was SO good to catch up with him!! He was the only friend I’d told about my visit since I thought I wouldn’t have time to see anybody. I also thought I wouldn’t be able to visit my old towns, Cheshire and North Haven, but both expectations were surpassed: we drove through both towns, and since Jared had to work at 9:30 a.m., I had the rest of the day to see other people. First I had the pleasure of visiting my old hangout, Music Center of North Haven. I even saw Mark, Mary and Donna Minotti! Then, since I was free until 2:30 p.m., Daddy Vecchio picked me up from Music Center and brought me to East Haven, where I saw the whole family–including cousin RiRi. Tyler was even home from Niger, which was a surprise to me! Silas practiced blowing bubbles–he just learned on Tuesday–and Mama fed me. She and I talked with her for an hour or so. I can’t express how happy I am to have seen them! Then several other cousins tag-teamed to get me back to the Providence airport that Friday night, and by 10p.m. I had landed in Chicago again. What a beautiful whirlwind of a break! Dear University of Missouri—dear black students and football players, thank you. Thank you for giving the rest of us hope for a change in racial relations. Thank you for striking the football games this weekend. You put it all on the line. Thank you, Jonathan Butler, for striking even your personal nourishment for the sake of your kinfolk. The slurs and taunts jabbed you, repeatedly, and you could not take it any longer. You have been fighting. I know you did not only start to fight with the strikes this weekend. You have been fighting for justice, and now, in the ultimate battle centered at the American field of glory, you have won. Friends, I was impressed when I read that you were striking until your former president, Tim Wolfe, resigned. The battle was set against you, yet you were bold. You were brave. And you were not brave in vain. This morning, on Monday, November 9, 2015, Wolfe resigned. I admit I was surprised. I can’t say I have ever seen such swift, radical change. But I rejoice with you! I just found out the news on a Facebook page for the black student union at my college, and I could not keep it in. I hastened to tell my friends in the Office of Multicultural Development and in the Office of International Student Programs, and now I am writing this note so that many more people can hear of your victory. Congratulations! Dear black students at Mizzou, your past attempts for justice are being rewarded. I respect you, and I thank you. Thank you for giving us hope for victory. Ever since I came to Wheaton, students and staff have been criticizing Koinonia, the Asian and Asian American fellowship on campus, for being exclusive. A few people, some of whom I know and love, have had bad experiences in the group, and many students make assumptions about it based on what they viewed as Korean cliques on campus. But I’d wager many of these critics have never gone to an event or taken the time to know the purpose and people of Koinonia, which incidentally is composed of much more than Koreans. I have been participating in Koinonia Large Groups for a couple years now, ever since Michael, my American friend of Chinese descent, invited me, an American of European descent. I’d like to tell you about the organization and its events to correct any toxic notions floating around campus. To start, Large Groups happen monthly. We usually play crazy fun, often awkward ice breakers – real ice breakers that create laughter and gleeful memories, not the basic what’s-your-name-and-major kind. We munch on snacks. We listen to a speaker share his or her testimony or speak on a given topic. (This last Saturday two Wheaton staff held a conversation on intercultural relationships.) The praise team often leads us in worship as well. 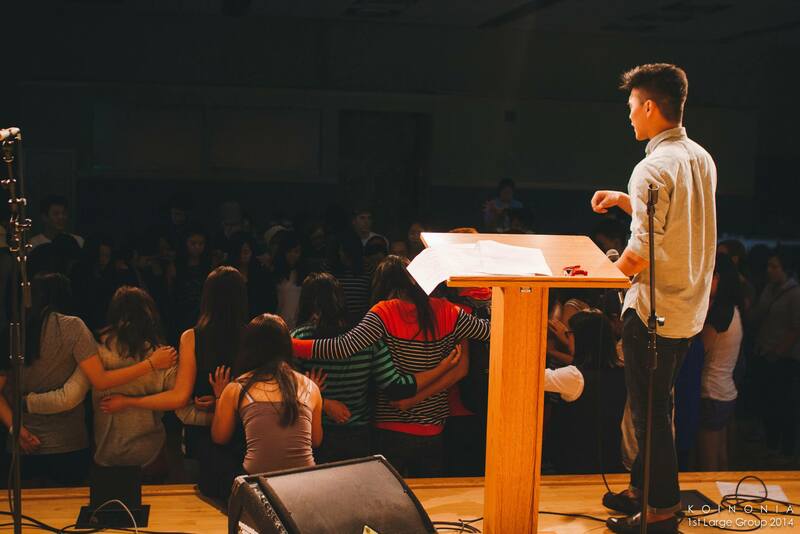 That’s why I fell in love with Large Groups last year—the worship. The prayer over and among us and the music we all sang together was powerful. Tangible. The organization also has Saturday morning prayer from time to time, and it begins each school year by praying over each class. I love how Koinonia prays. Annual prayer over each class at the first Large Group, Aug. 2014. 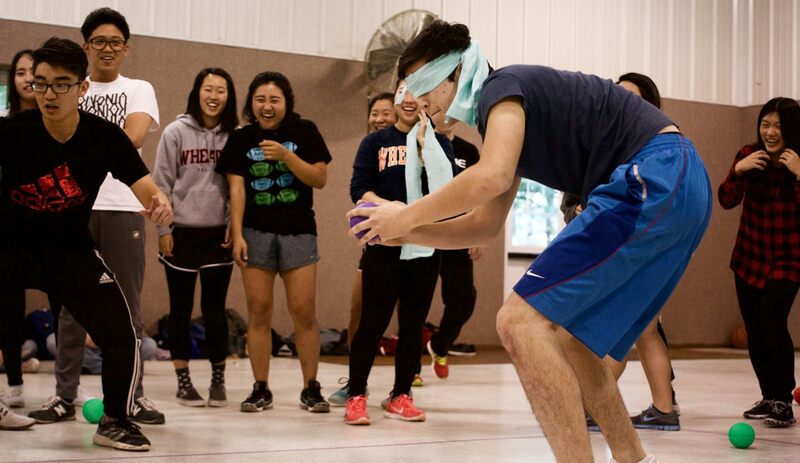 The organization offers multiple activities throughout the year such as the Fall Retreat, Under-Upper Football and Family Group Olympics. Family groups, another name for small groups, generally meet weekly to establish close knit communities under the larger umbrella of Koinonia. Koinonia also hosts the annual Lunar New Year Festival, which was one of my favorite events freshman year. If you read my article for the Wheaton Record that year, you could not have walked away feeling excluded; the then-president made it his mantra that the event was open for the entire campus! So why does Koinonia get such a bad rap? It’s one of the largest organizations in the Office of Multicultural Development, and Asians are the largest racial category on campus, so perhaps it’s simply better known. But it seems better known in name than in heart. Last year’s president, Jen Fu, did a fantastic job of making me feel wanted in Koinonia, and this year I have several friends on Cabinet. I’m as involved in Koinonia as I can be without being in a family group. And as a participating member of the group, I would be blind if I overlooked the mission of this year’s Cabinet in relation to engaging with the broader campus. The Cabinet wants Koinonia to be a support base for Asian students yet not be these students’ entire collegiate world. One last thing: Friends generally become friends because of some commonality. In sociology we call this homophily. In a place where one may be the minority, racial or cultural similarities can be an extra draw. Everyone needs friends who can understand each other. I rejoice that Koinonia is a context where a racial minority group in the broader U.S. society can come together in a sort of ethnic enclave and actually have power and can celebrate its various cultures in a safe space. This homophilous group only becomes cliquish and thus sinful when it excludes others. For example, white students group together all over campus. Why then do many people pick on the minority for this? I beg these critics to stop picking on the organization of Koinonia, other Asians or Asian Americans and specifically people of Korean heritage, who tend to be pegged as the most cliquish. Please examine your own friend group. Look for a plank in your eye before you point out a speck in another’s. Being composed of humans, Koinonia is not perfect, but the accusations against the organization no longer seem appropriate. I plead with you to respect Koinonia and the people in it and to give the organization a chance before you judge it. Do not perpetuate incorrect, negative assumptions and stereotypes about other Asians on Wheaton’s campus either. 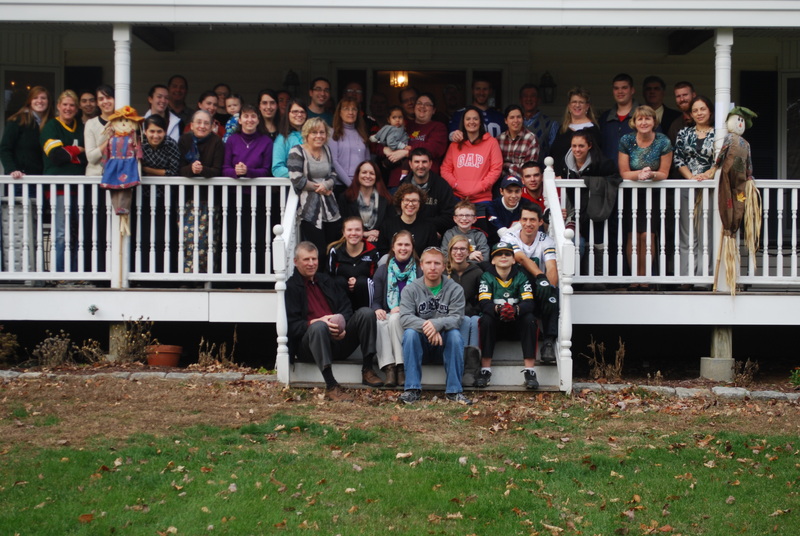 As for Koinonia, the organization boasts phenomenal people who are truly building up Christ’s church. I ask you to do the same.